From our Louisiana depot, we serve the United States oil and gas market through our locally based regional partners. Our equipment is available through our partners whose own local technicians have been trained in the use of pressurized welding enclosures (PWE) and certificated to the Safehouse competency standard. Our market leading range of products have been confirmed as satisfying the needs of the US market, meeting BSEE standards, which enables us to work effectively with the oil and gas industry offshore and upstream in the Gulf of Mexico as well as inland and downstream across the entire continent. We also work throughout the US to provide cost effective engineered protection for other industries, including chemical processing as well as food manufacturing, where repair and maintenance work – in either hazardous areas or areas requiring the local environment to be controlled for the repair to take place – can continue with the support of our SAFEHOUSE pressurized habitat system and locally-based, trained personnel. The world’s largest oil discoveries in recent years are in Brazil’s offshore, presalt basins which are also estimated to contain sizable natural gas reserves. Increasing domestic oil production has been a long-term goal of the Brazilian government, and discoveries of large offshore, presalt oil deposits have already transformed Brazil into a top ten liquid fuels producer, the world’s ninth largest producer of oil and third largest in the Americas behind the US and Canada. Almost all of Brazil’s oil production is offshore in very deep water and consists of mostly heavy grades. From Rio de Janeiro to the Amazon region, Safehouse provides engineered protection across the supply chain through our strategic partner Priner Serviços Industriais in Rio where an equipment stock holding is supported by competent, trained technicians to work on the design, delivery, installation and management of your pressurised hot work habitat requirements. As the world’s fifth largest producer of natural gas and crude oil, and the world’s largest reserve holder after Saudi Arabia, we’re delighted to bring our Safehouse products and services to the Canadian market. From St John’s to Victoria, we can supply engineered protection for working in the harshest of conditions, ensuring workforces remain safe and productive when working on ‘live’ plant or installations, and enabling repair locations to be ring-fenced with managed atmospheric conditions, when the environment outside is hazardous. Bordered by the North Sea to the north, where much of the country’s offshore energy sector is concentrated, The Netherlands is the second-largest producer of natural gas in the EU, and this plays a significant role in the country’s energy sector. Neighbouring Belgium is a major hub of gas flows in the region, and although it has no indigenous oil production, its world-class refineries process considerable volumes of crude oil. Belgium’s large domestic oil refining sector benefits from the country’s robust transport network that is well integrated with other countries through 18 entry points. Safehouse is available exclusively to customers throughout Holland and Belgium through our partner, Eqin, which has its main locations in Groningen, Elsloo, Rotterdam and Antwerp serving all major downstream companies, upstream gas, and midstream operations in the petrochemical, gas production and processing and chemicals sectors. With locally held stock of our equipment, Eqin’s technicians, who have been trained and certificated by Safehouse, will work with you to design, deliver, install and manage engineered solutions for protecting your people, assets and production. Indonesia’s oil sector has historically been operated by several international companies. Most recently, the national oil company, Pertamina, has been growing its footprint by taking over expiring contracts. However, producing oil fields are declining in output as they mature, and the Indonesian government is pushing its efforts to curtail shortages in energy supplies, while spurring investments in the upstream sector. We have been in Indonesia since 2011, working with the major operators, including BP, ConocoPhillips, CNOOC, Pertamina Hulu Energi, Premier Oil, and Santos, along with various EPC contractors, to provide safe working environments for construction, repair and maintenance projects. Our local, Jakarta-based, partner offers our customers here the complete range of Safehouse products and services through a local stock-holding of our products supported by a team of locally based technicians fully trained by Safehouse. The energy sector accounts for around 45% of the country’s GDP and is integral to long-term economic growth and development. The majority of exploration activity here is on land and in shallow water. Not only is Trinidad and Tobago the largest oil and natural gas producer in the Caribbean, but it is also home to one of the largest natural gas processing facilities in the Western Hemisphere – The Phoenix Park Gas Processors complex which is located in the Port of Savonetta. It is also the world’s largest exporter of ammonia and the second largest exporter of methanol. From our partner’s base in Point Lisas, Trinidad, we have been supplying our equipment and fully trained, Safehouse certified, service technicians to safely and cost effectively deliver projects since 2003. Our local partner, Stork Technical Services, provides and uses our equipment and local technicians who have been trained and certificated by Safehouse. Working with our customers to design, deliver, install and manage habitat technology for onshore and offshore applications, our local stock holding and trained technicians are also supported by our global team. If additional equipment and people are required for major projects, we provide assistance with our own technicians working alongside the local workforce. When additional equipment is required this is also supported from our global HQ, and is made readily available to our regional partner and the local customer base to ensure all customer requirements are met. Africa is home to some of the world’s fastest-growing economies, many of them buoyed by new oil and gas finds. With oil reserves and production expected to increase over the medium to long term, the market continues to be a key player in global energy. We have a proven track record of working with oil majors BP, Chevron, ExxonMobil and Total throughout Africa, and our SAFEHOUSE habitats and engineered protection systems are available across the continent in the main oil and gas producing countries such as Algeria, Egypt, Nigeria and Mozambique. Our presence in West Africa, including Angola, Congo, Gabon and Ghana, is serviced by our partner, Prezioso Lynjebygg. 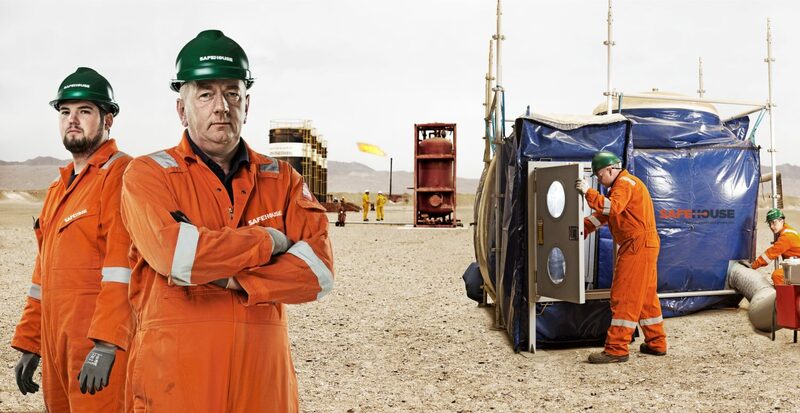 With locally-held equipment, in country resources and Safehouse trained personnel, we are able to support offshore, including FPSO, and onshore projects throughout the oil and gas supply chain – enabling repair and maintenance work to continue safely whilst plant is live. Our early intervention will help to maintain production and save costs, whilst keeping your workforce safe.